Each set has 3 big wide textile leaders with zipper. (top, take up and back layer). All textile leaders have marked guidelines and centres of the quilt. Package contains also 3 sets with 3 additional narow textile zippered parts A, B, C, that help you work simultaneously on 3 quilts in the same time. 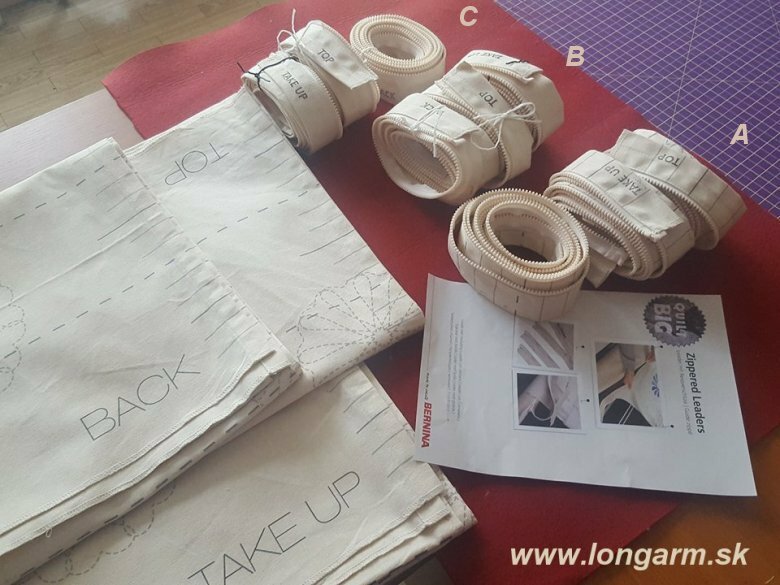 For what do I need zippered leaders to quilt on my longarm? Another client is comming to rent your frame, because she plans to buy it in next future. This situation has the only one solution - zippered leaders! 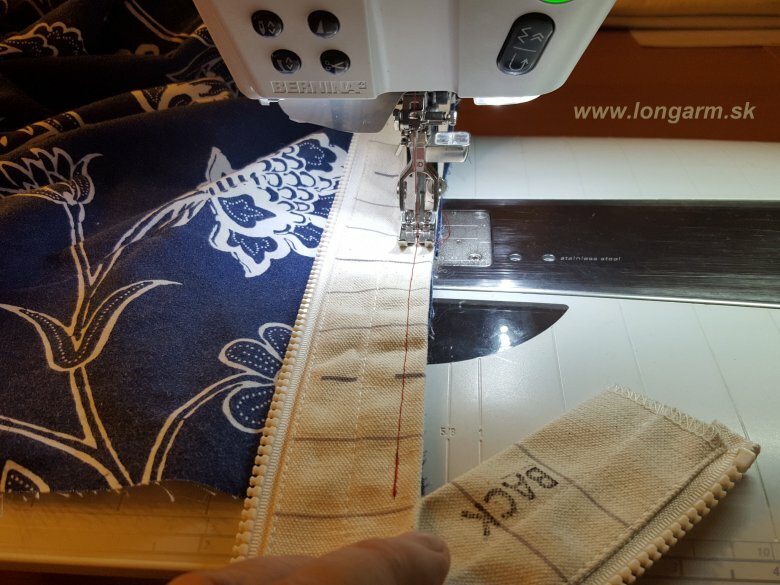 How longarm zipper leaders work? 3 wide zippered leaders are attached to the quilt frame. 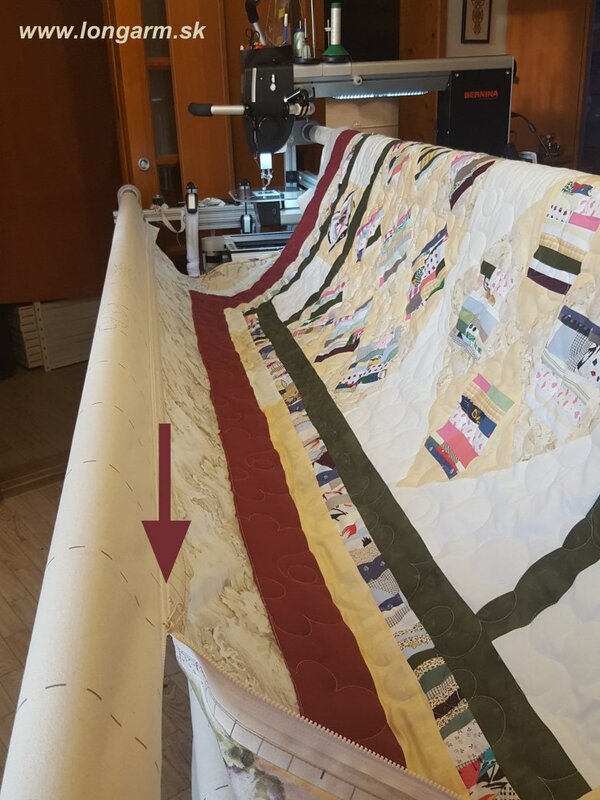 One is attached to "take up" rod for ready quilt, second is in the rod for back layer of quilt and third is connected with rod for top patchwork layer. 3 narrow zippered leaders are attached to your quilt. 2x to top and bottom side of back layer, 1x to top layer. 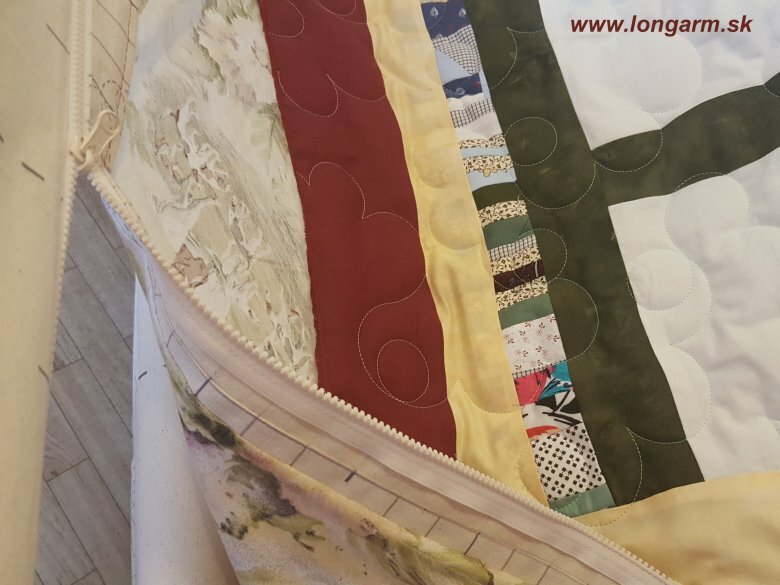 In case, that you quickly need to change quilt on your longarm to another one, unzip = open zippers from separate layers and attach another quilt to your frame. You need less than 5 minutes to the whole modification. Do I attach narrow take up zipper leader from front or back of frame? Some quilters stay during this process in front side, some in back side of frame. 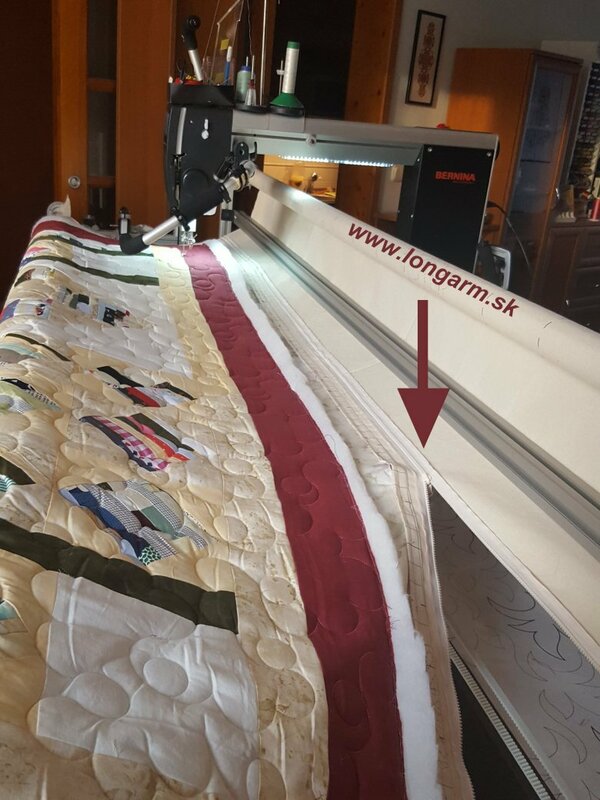 The longest "Take Up" textile layer should be attached to Take UP rod in such a way, that visible lines point to the frame shelf. Narrow part of zippered leader with sign "Take up" sew to the top of bottom layer in such a way, that zipper runner points to the floor - see the picture below. How to attach zipper leaders to the top layer of the quilt? If ready to quilt patchwork top is ideal without wavy and convex parts, it is possible not to attach it to the top rod. Patchwork top could simply lai on vadding and bottom layer of quilt. You attach bottom quilt layer directly on top rod in this case. Your rod for bottom layer is not occupied. Tip - Raise the top rod to its upper position. Do not work on your knees ! It is advisable, if zipper runner points toward the ceiling in this case, so You can easy handle with it. Detail of attachment - bottom layer attached directly to Top rod. Back rod is not occupied. Second way is to attach bottom layer to the Back rod and top layer to the Top rod. In this case is advisable to attach both zippers (top and bottom quilt layer) in the same way (pointing towards the ceiling). It would be easy to move your quilt quickly from one rod to another. How to attach zipper leaders to your bottom fabric and patchwork top? It is easy! Sew them there. Choose stitch with length 5-6mm depending on possibilities of your sewing machine. I used function to omit every second stitch. My stitches had length 10mm. I secured beginning and end of stitches. Some users prefer to sew zippered leaders to their layers in another way. I like more alternative, where I adjust edges of fabric and zipper leader together on right side.